Actually, it is a standard physiotherapy ball used in physical therapy departments all over the world. 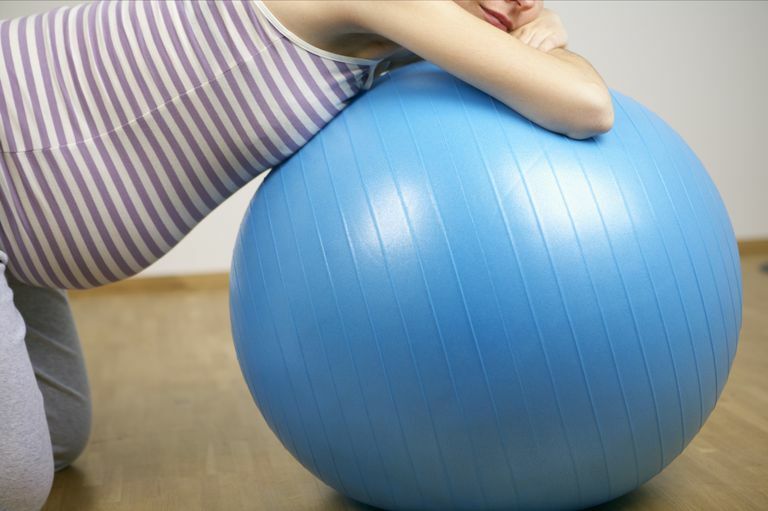 Many physical therapists seem to be drawn to the labor and birth arena, and somehow someone got the idea of letting pregnant women sit on the ball, and eventually its use also expanded to include labor and birth. These balls are great for relieving discomfort during pregnancy. It provides a firm, yet soft place to sit. It also forces good posture, allowing for decreased straining of your muscles. When moms are learning to squat the birth ball can help them achieve this without the need for a partner. Simply by placing the birth ball on the wall and then leaning with it against your shoulder blades, you can learn to squat and gently ease into it, without fear of falling and no partner required! For labor positioning and birth, the ball can be brought by the couple or the doula, or owned by the hospital or birth center. In a home birth setting, the practitioner may have a birth ball or they can be purchased very inexpensively and work well as a play toy for the kids! My kids and I are constantly fighting over the ball. They refuse to believe it is related to my work. I personally used my birth ball in labor to sit on and then leaned over a stack of pillows on my bed. This allowed me to sway my hips back and forth and yet lay down at the same time. I spent many hours like this. It also gave room for my husband and doula to rub my back. It can be used in conjunction with fetal monitoring, and are great when you are experiencing back labor. They will not only make your labor more comfortable but have been shown to aid the turning of the baby due to the position mom is in on the ball. Some hospitals also use this in conjunction with light epidural anesthesia. When Should You Avoid an Exercise Ball? If you aren't sure if your hospital or birth center has a ball or has ever used a ball, ask when you take your hospital tour. They should be able to tell you. If they don't know, ask to speak to the charge nurse or the floor manager. They may need to do research and write a policy before you can use the ball in the hospital. This is something other hospitals are often willing to share informally. If you have any doubts find a ball and sit on it. Your mind will be changed instantly!